A witness has told the Ballymurphy inquest he remembers the blood of a shooting victim running down his arms, as he carried his body. Brian McLaughlin was a community and youth worker in the Moyard area on 9 August 1971, when Fr Hugh Mullan and Francis Quinn were shot and killed. He did not see anyone being shot that day. But he said he later helped to move the body of Fr Mullan to a house where he and others took the remains upstairs. "His blood ran down my arms," Mr McLaughlin said. "This has always stuck with me. "I remember thinking, 'Why is this happening?'" 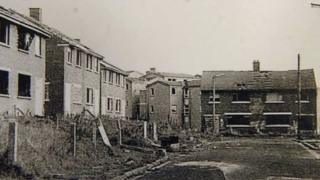 Mr McLaughlin, who is now aged 74, went on to describe the mood of fear in the area that day, when internment had been introduced, and when there was both rioting and gunfire. "It was a nightmare we lived," he added. "Nightmares, they don't fade that easily." He also told the court he had seen one "young fella" in the Moyard area with a revolver. He had not recognised him. Mr McLaughlin said he observed the man for about 15 minutes, during which time he made no attempt to fire the revolver, but rather appeared to be trying to hide. Mr McLaughlin said there was firing from what he believed to be the police, the Army and "the Protestant population" in Springmartin. He said he thought the man with the revolver would "have been insane to use it", especially as he would have endangered others taking cover near him. At one point as he tried to help those who were injured, Mr McLaughlin said he could hear the "bullets zinging by", and believed he had been the target at whom the gunmen had been aiming. Like several other witnesses to the inquest, he thought the shooting had come from Springmartin flats. Later, Sean Daly told the court he had gone to help Bobby Clarke who was shot on waste ground, and had removed his own white T-shirt to give to Fr Mullan to use as a white flag. He recalled seeing Fr Mullan leave for help, and then go down when he was shot. During a second burst of gunfire, Mr Daly said he was hit himself, in the toe. He said he crawled from the area and hid in long grass, before being rescued about half an hour later. Mr Daly told the court he was "proud of how quick I got out of that predicament". "I was afraid, I was scared, I was waiting for the final bullet to come my direction," he added. Mr Daly escaped the area with the help of two first aid men who helped him out of the corner of the field. He described later having his wound examined by a doctor, and receiving about £200 compensation for the injury. He also described a faint recollection of hearing a brief burst of gunfire from the Moyard area towards Springmartin earlier in the evening. Ten people were shot over three days in August 1971. Later the court heard from Michael O'Hara, a nephew of Joan Connolly, the only woman to be shot in Ballymurphy during those days. He explained that this was the last night he ever saw his aunt as she was out searching for two of her daughters. He remembered that while he was walking home he had seen many paratroopers patrolling the area, and that one had said to him: "Michael, stay off the streets tonight." Mr O'Hara said he had thought it wiser not to respond to the soldier, especially as he was on his way home anyway. He had gone into Springfield Park at one stage to help defend the area, and witnessed damage to the houses there from missiles thrown from Springmartin. He went home when gunfire began shortly afterwards. Mr O'Hara described how later that evening he and his family sheltered with neighbours and young people in their home in the Moyard area during a period of intense gunfire. After things had calmed down, they went to the nearby home of a neighbour where two children had been sleeping, and found it had been hit about 50 times by high velocity rounds. The extensive damage was filmed the next day by a television news crew.